A shortish blog this time but a lot of great things coming up across the country. I do hope you’re able to get to some of these, below – most of these events demand so much work by volunteers and without whom, these darker nights would be pretty dull indeed. Many thanks to everyone who have emailed me recently – lots of interesting storied and things to watch out for. Keep them coming. On a sadder note, Maggie Boyle died yesterday, surrounded by her family after a long struggle with cancer. A very very sad loss to us all; a beautiful singer, flautist, musician and woman whose singing and laughter I shall miss terribly. It’s difficult to know what to say, really, except that I shall treasure her ability to laugh and see the small beauties in life. . .which we can all too easily skip over in our rush to live. Warmest wishes to all of you – see below for lots of great events. 1. 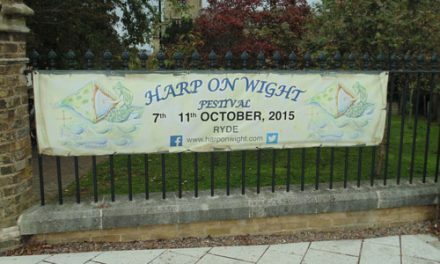 HARP ON WIGHT is fast approaching! Here’s the full programme and something for everyone. There’s been an amazing response to the harp new music competition which is very exciting! I do hope some of you can get to some of the fantastic events that are happening all week – it’s an amazing event! 2. 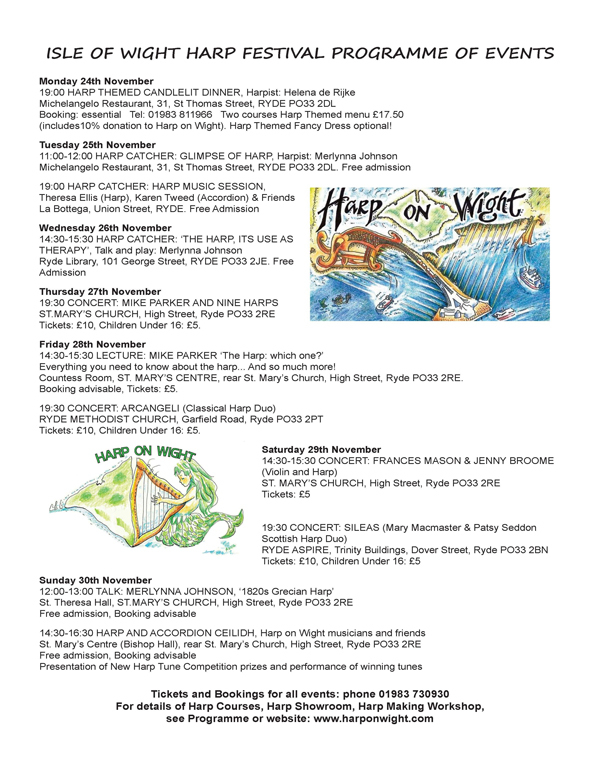 Vaguely Sunny are as busy as ever with some great events coming up on the Isle of Wight too (they are also part of the Harp On Wight organising team) – so inspirational both in their programming and venues. I am biased, of course. . .Dimbola being one of my favourite places to visit, perform in, meet friends there and see really inspiring exhibitions. . . This Sunday, they will be hosting visionary poet, Andrew Aidan Dun at Dimbola Museum and Galleries at 7.30pm. Tickets are £10.00 and seating is limited, so don’t delay! Tickets can be booked from 01983 730930. Then on 13th November, Vaguely Sunny are presenting Sharon Shannon with Alan O’Connor in concert at Medina Theatre, Newport. Tickets are £17.50 advance / £20 on the door and can be booked from 01983 527020. 2. 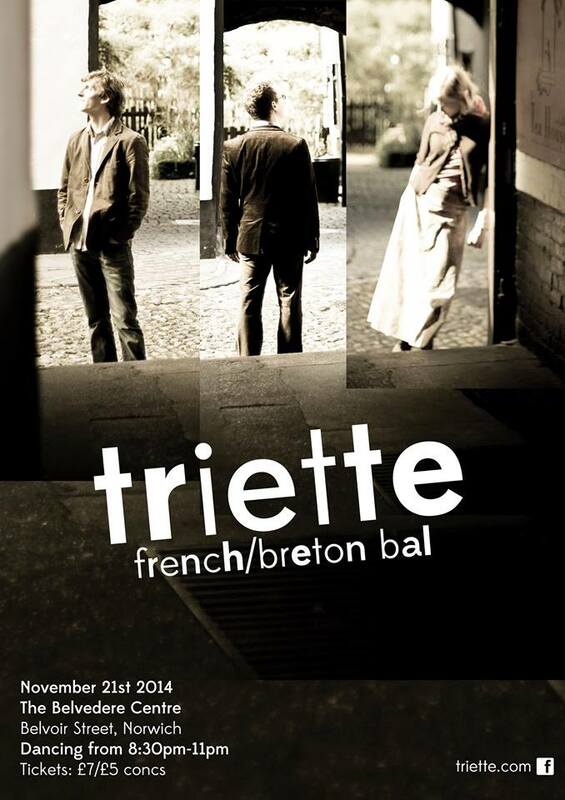 TRIETTE are doing a bal in Norwich at The Belvedere Centre, Belvoir Street, Norwich. Friday 21st November, 8:30 start dancing! £7/£5 concs. The Trip to Birmingham TradFest is the UK’s newest Traditional Irish Music Festival, to be staged over four days from 27th-30th November 2014 in and around Digbeth – the Irish quarter of the city. The festival aims to promote and celebrate the rich Irish music history and cultural heritage of Birmingham. Four concerts will be held over the four day period, showcasing some of the most established names in Irish Traditional Music, as well as giving young, up-and-coming musicians the opportunity to perform alongside them. Artists include Frankie Gavin & De Dannan, Brian Finnegan Trio and Long Acre (one of the biggest Irish Traditional bands in England during the 1980s, reuniting for a special one-off gig at the festival), to name but a few! With concerts, sessions and workshops we aim to reinvigorate the passion that was seen in the city in days gone by, for attending live music events – especially within the traditional/folk idioms, and for the participation in performance related activities. Workshops will be held, taught by tutors playing at the festival, giving participants the opportunity to learn about the musicians’ personal philosophy and approach to playing traditional music, as well as receiving guidance on technique, style and repertoire. We are also very happy to be running an U25’s set dancing workshop! Participants of any ability/experience level can take part, learning in a fun and relaxed environment aimed at young people who want to try their hand at Irish set dancing. Sessions will be run by musicians appearing at the festival as well as other highly regarded musicians from Birmingham, the rest of the UK and Ireland. Musicians and singers of any age and ability are encouraged to join in and of course anybody who wants to listen is more than welcome! The name of the festival is derived from the famous reel, ‘The Trip to Birmingham’, written by Sligo flute player Josie McDermott about a trip to the city in the 1960’s. We hope to see you there for what promises to be a mighty weekend of craic agus ceol, fun and music! 4. Isle of Wight Artist Zoe Barker emailed to tell me that following the success of their first collaborative exhibition last year, TRAC artists Zoe Barker, Freya Conway and Lyndy Moles have got together to create a new body of work inspired by and including textiles. To be held at Ryde Library, 101 George Street, PO33 2JE from 6-8pm. We much look forward to seeing you there. 6. Jewellery Artist Linda Newnham emailed me with the following super news! I’m a big fan of her glass jewellery. . . I entered a necklace into the British Bead Awards and I got the result of yesterday. 2nd place. I did a blog post if you’d like to read all about it. 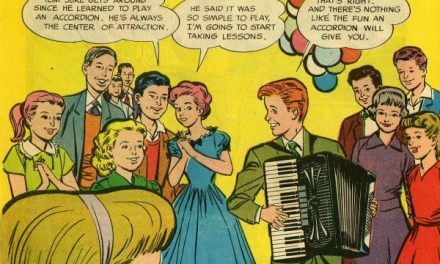 I am wanting to move on from my 48 bass accordion (Black Diamond) and wondered if you know of anyone that might be interested in it?